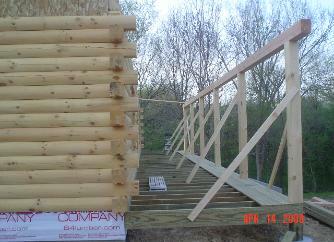 Below are the weekly updates of the construction process from start to finish with comments and pictures. 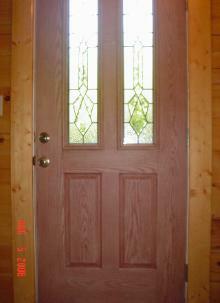 Call us at 208 881 8564 or e-mail us to make an appointment. 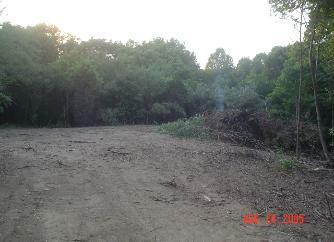 This is a picture of our property before the start of construction. 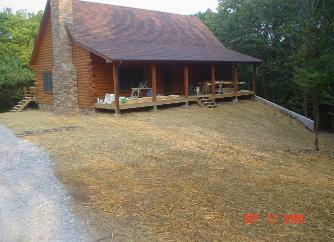 The house will sit where the pile of trees are on the right hand side of the picture. 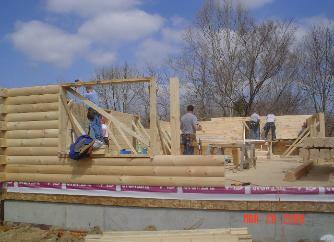 January 27, 2006 – Construction has started! 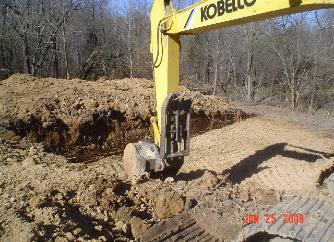 Above the excavator digs the basement with a trac-hoe. 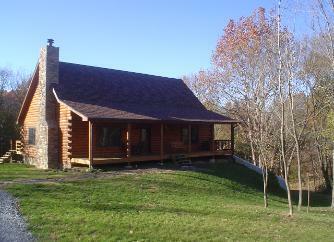 Let’s hope Mother Nature cooperates! 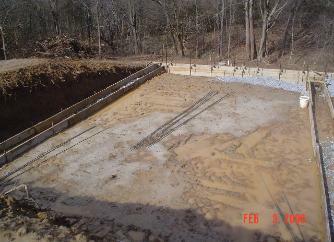 February 4, 2006 – Basement footing forms were set up this week. 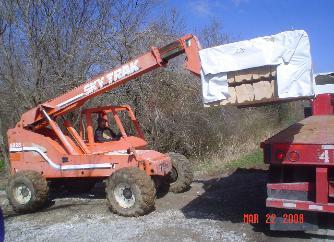 February 11, 2006 – No new progress with all the rain. 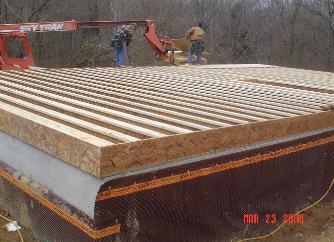 We should start pouring the footing next week if the weather cooperates. 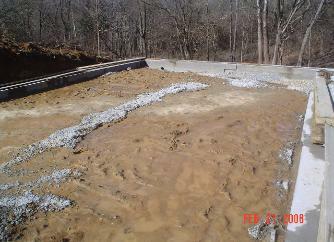 February 18, 2006 – Footing was poured on Monday of last week. 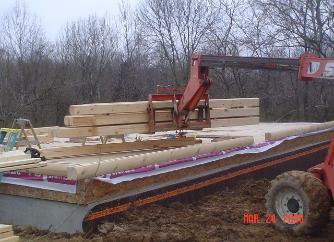 February 25, 2006 – No new progress with the rain. 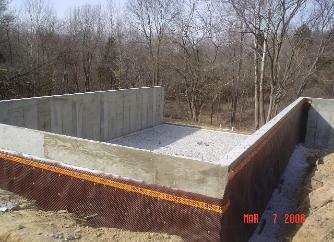 Forms for basement walls should start going up on Monday! 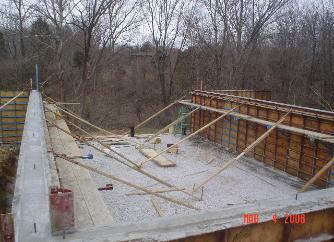 March 4, 2006 – Basement walls were poured this week! 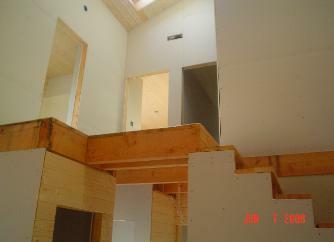 March 11, 2006 – Forms were stripped off and plumbing roughed in basement. 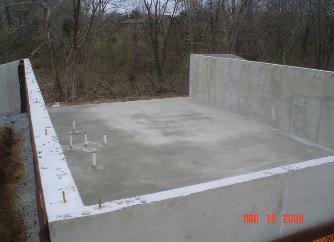 Basement floor will be poured this week! 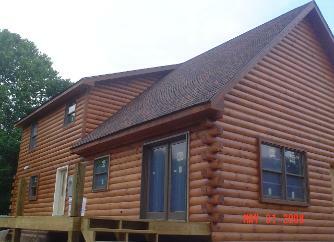 Logs will arrive next Wednesday! 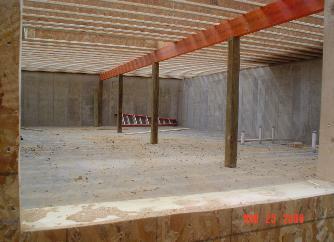 March 19, 2006 – Basement floor was poured! 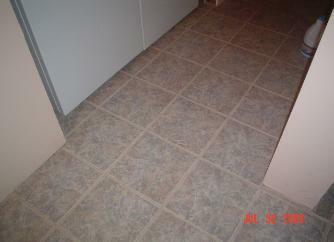 Dirt will be backfilled and construction of the floor will begin Monday. 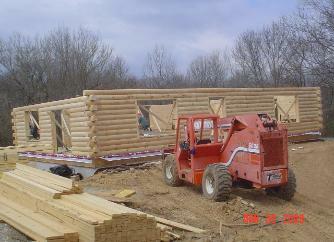 Logs will arrive on Wednesday and will start to be stacked weather permitting! 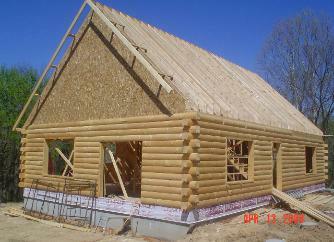 March 24, 2006 – Logs are here! 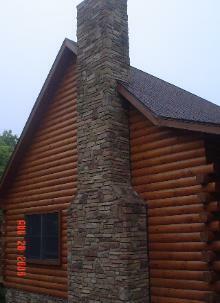 Above the floor is built and the first course of logs are stacked. 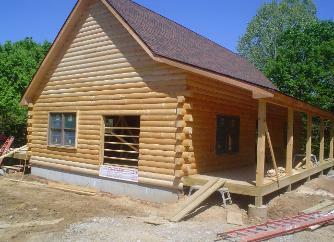 The logs will go up quickly! 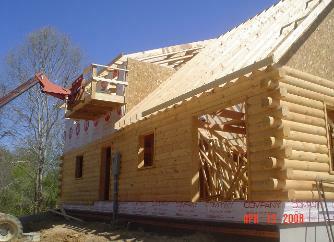 April 2, 2006 – Log walls are up! 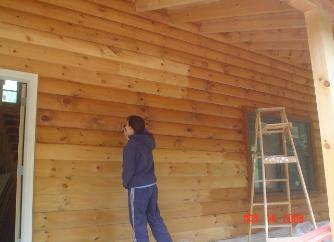 A lot of progress has been made with the good weather. 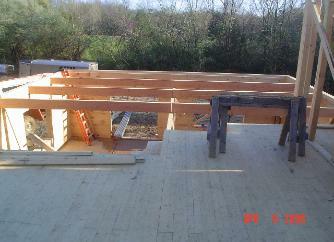 Above right, the framers install the second story floor supports. 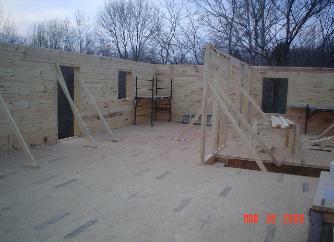 The second floor and the roof will be going on this week! 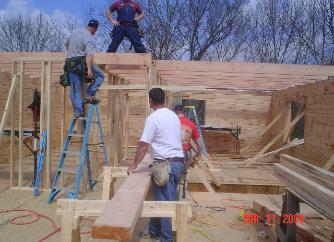 April 9, 2006 – Second floor is going up! 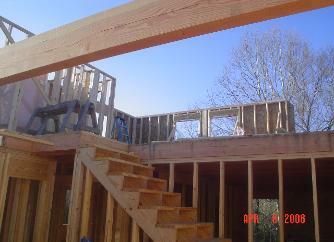 Top right, the framing of the second floor and bottom right, a shot from the second floor overlooking the Great Room, Kitchen, and Dining Room. 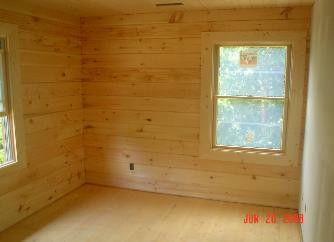 Bottom left, is the Master Bedroom. 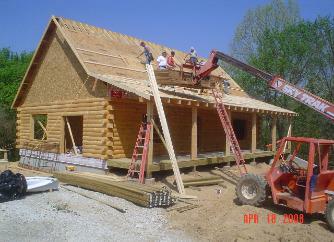 April 14, 2006 – Roof rafters are up and the roof is starting to be decked! 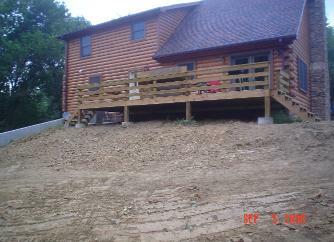 Bottom right, construction of the porch has started! 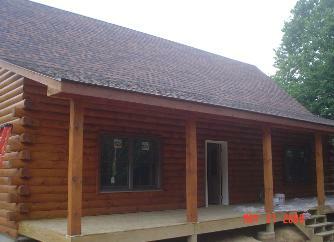 The roof and porch will be completed this next week. 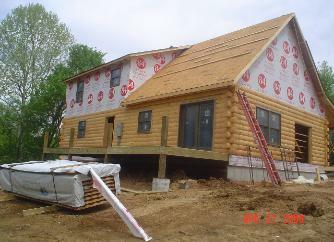 April 22, 2006 – Porch and decks are on, windows are in! 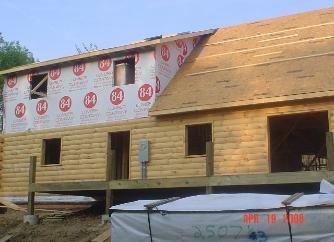 The roof has started to be shingled. 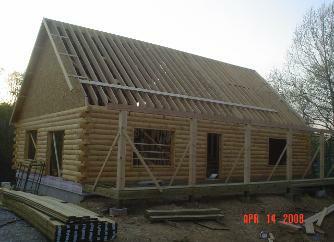 The roof will be finished this week and work will start on the inside next! 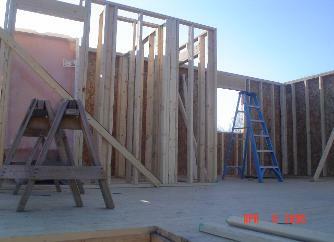 April 29, 2006 – Work continues on the second floor. 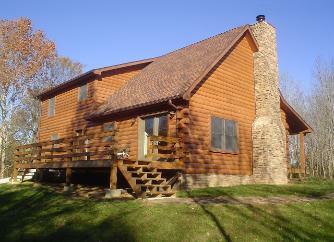 Bottom right is the walkout basement. 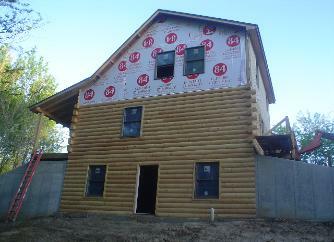 Work should finish on the outside this week. 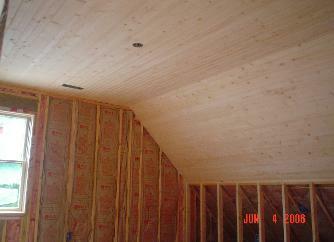 Next, will be the inside work on the tongue and groove on the ceilings! 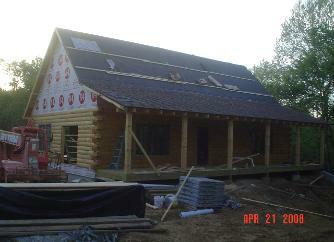 May 6, 2006 – Work has finished on the outside! 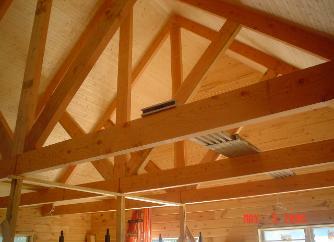 The trusses and tongue and groove on the ceilings in the Great Room, Kitchen, and Dining Room has been finished also!! 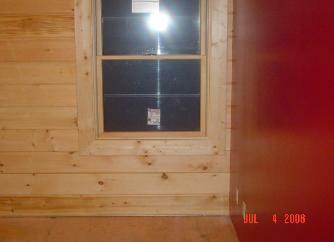 May 14, 2006 – Staining and sealing begins while inside the rough-in of the plumbing, electric, and HVAC continue! 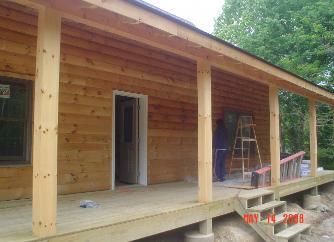 May 28, 2006 – Staining will finish this week. 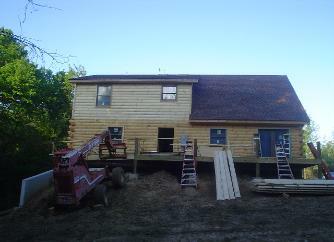 Also this week, tongue and groove will be hung in the upstairs bedrooms! 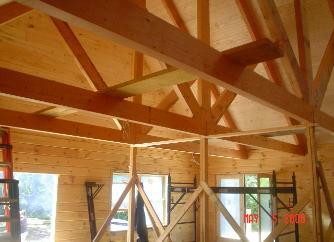 June 4, 2006 – Tongue and groove has been hung on all upstairs ceilings and metal plates have been put on trusses! 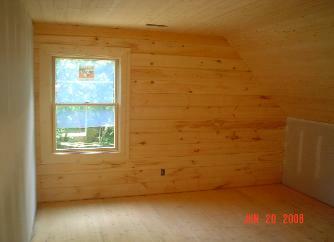 This week, drywall will be installed. 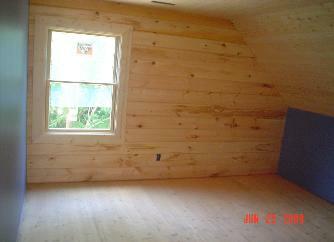 June 11, 2006 – Drywall is in and log siding is installed in the upstairs bedrooms! 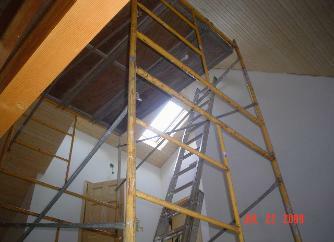 Drywall will be mudded this week and painting will start soon! 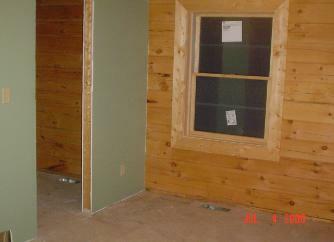 June 20, 2006 – Drywall has been mudded and window trim is on! 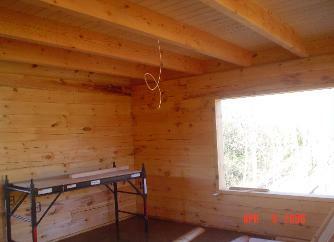 This week, the interior logs will receive a clearcoat, the drywall will be painted, and the ceramic tile will be installed! 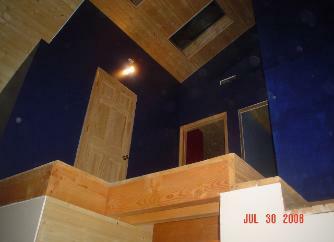 June 27, 2006 – Painting has started! 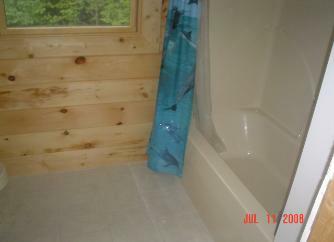 Above left is the Master Bath and above right is one of the upstairs bedroom! 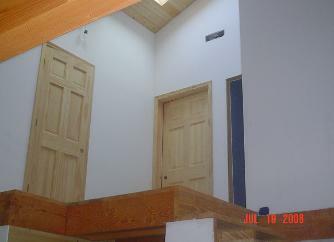 July 4, 2006 – Painting and more painting; above left is Master Bedroom and above right is upstairs bedroom. 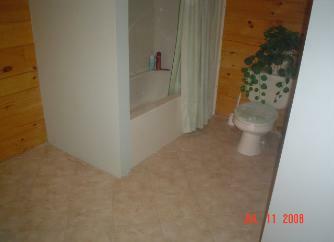 Both bathrooms will be finished this week and lighting fixtures will be installed throughout the house! 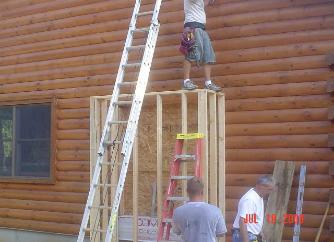 July 19, 2006 – Interior doors are being installed and the work on the fireplace has started! 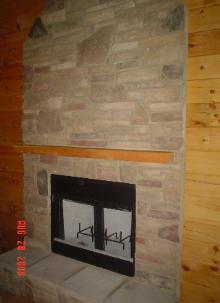 July 23, 2006 – Fireplace work will continue this week. 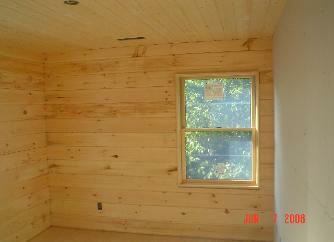 Inside, the ceiling receives a clearcoat! 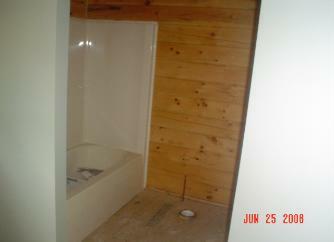 July 31, 2006 – Painting continues while the tiling is finished in the Laundry Room! 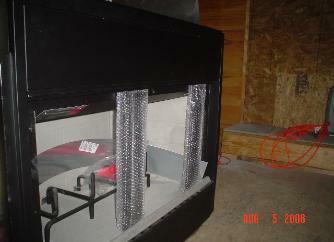 August 5, 2006 – Exterior Doors are stained and the Insert for the Fireplace is ready to be installed! 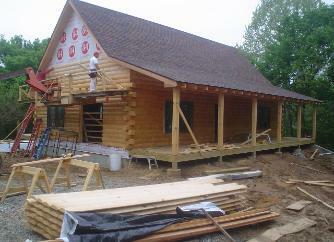 August 13, 2006 – On vacation last week, no new progress. 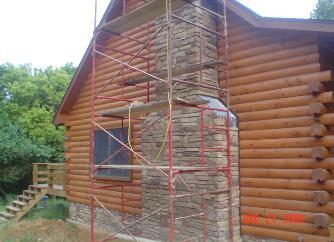 August 21, 2006 – Fireplace stone is being installed and second floor floors are sanded and sealed! 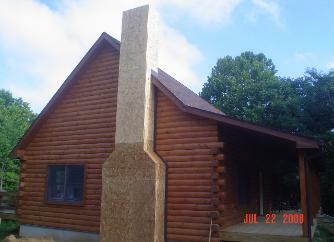 August 28, 2006 – Fireplace is finished! 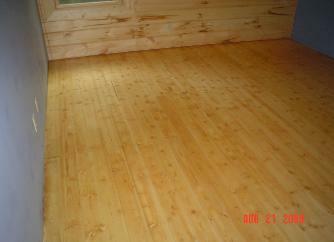 First floor floors are next! 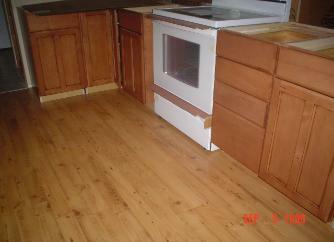 September 5, 2006 – Floors are finished, kitchen cabinets are in, and the yard is being prepared to be seeded! 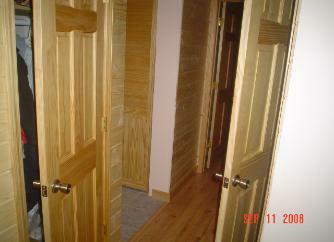 September 11, 2006 – Interior doors are in and yard is finished! 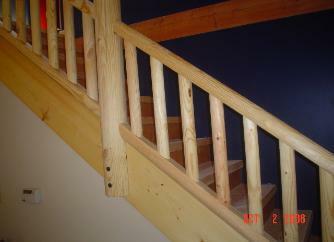 September 18, 2006 – Stairs are being completed. Everything is being wrapped up! 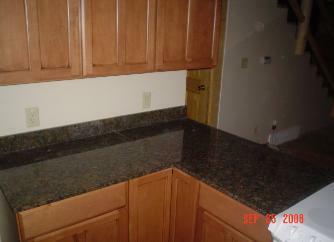 September 26, 2006 – Counters are in! 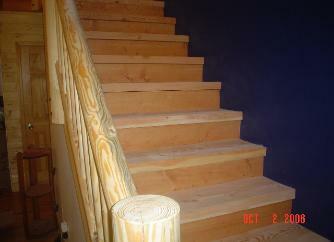 October 2, 2006 – Stairs are finished! This concludes our weekly updates. 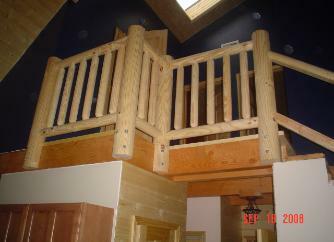 Call us at 208 881 8564 or e-mail at scott@rivertoriverloghomes.com.